This is an update on job polarization in the U.S. and across states, based on the new occupational data BLS just released on Wednesday. It is important to point out that the process of job polarization is best seen through the occupational lens, not via industries as some other studies use. The reason being is that technological change impacts specific job types and responsibilities, which cut across all industries. Possibly the best example is office and administrative support workers. No office today resembles Mad Men. The ratio of workers to admin support staff has never been larger than it is today. Of course this is not to say that today’s admin workers are not valuable, it’s just that with technological change they’ve never been more efficient and productive. They are able to carry out the workload of multiple employees a generation ago. Nearly all firms hire admin workers, so examining trends by industry would miss such a fundamental shift in employment and job polarization. The good news is that middle-wage jobs are starting to make a comeback. 2014 was the best year for these jobs since 2005, both in the absolute number of gains and in terms of growth rates. 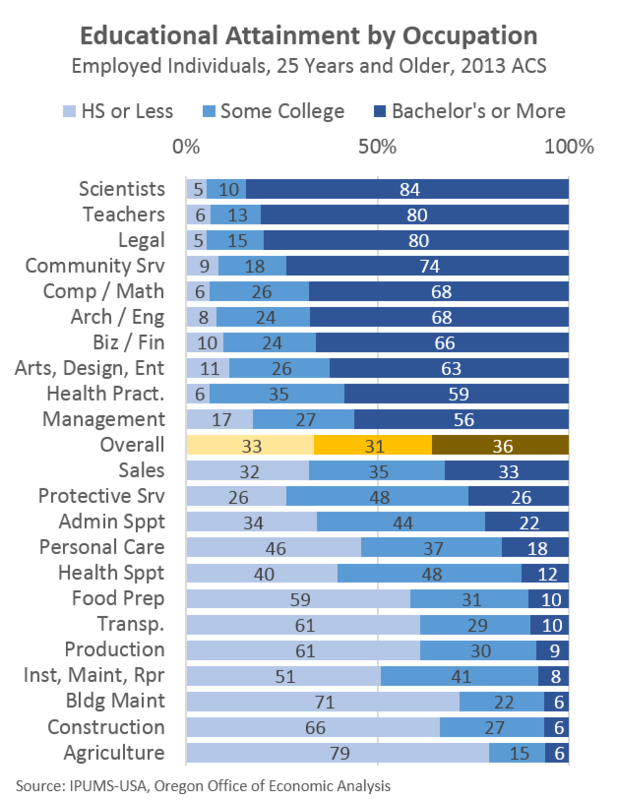 Much of the improvement can be tied to construction workers, however 8 of the 11 broad occupational groups within middle-wage jobs picked up in 2014, including teachers and admin support, while production and transportation remained strong. While economists debate the semantics of the manufacturing renaissance, production employment is clearly on the mend. 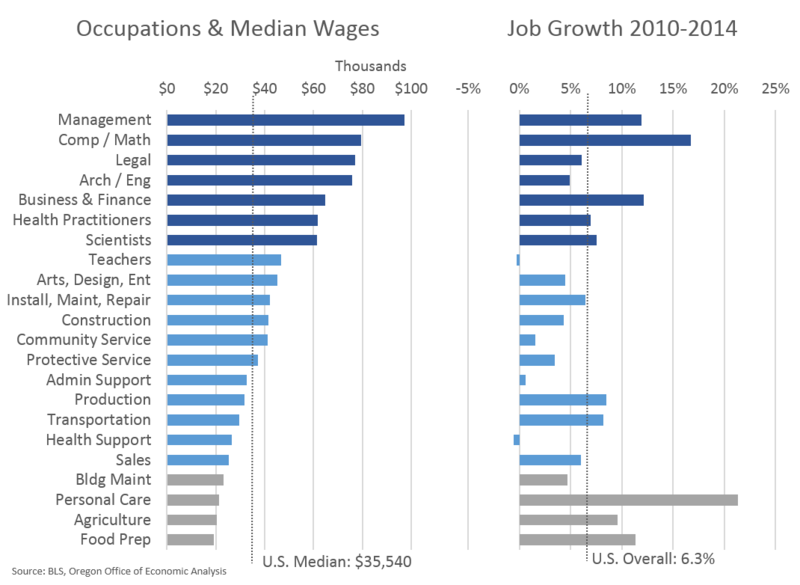 That being said, middle-wage jobs still trail the top and bottom. Specifically, while high- and low-wage jobs have fully regained their recessionary losses and never been more plentiful, middle-wage jobs have regained just 43 percent of their losses and remain 4.6 percent below their peak levels. A majority of Americans are still employed in these occupations (62 percent), and while middle-wage jobs will continue to increase in aggregate, their share of the labor market is shrinking. See here for more on the middle-wage job outlook. It can be important to point out that education, at least in the form of a 4 year degree or higher, is not the be-all and end-all of a good paying job. 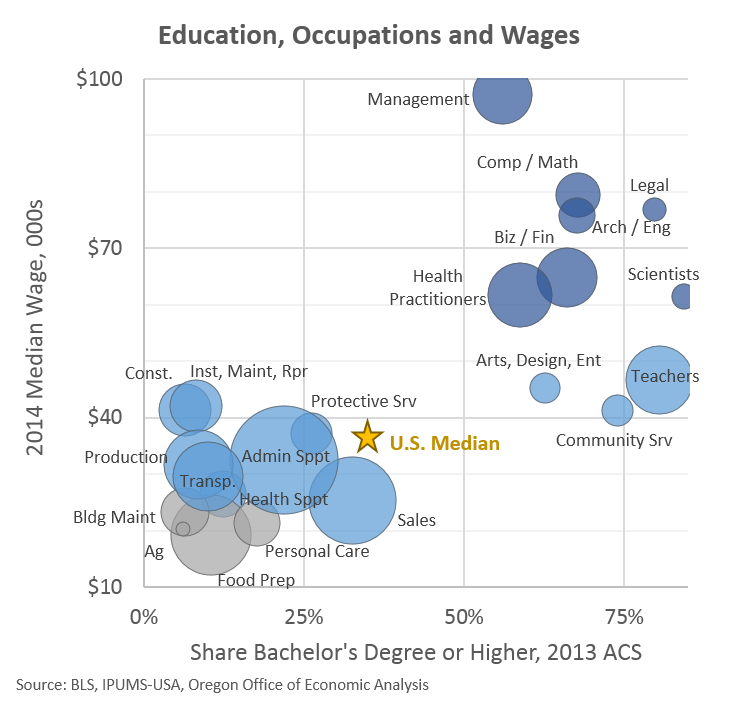 Yes, a college degree is one’s best or clearest path to a high-wage occupation, however there is substantial variation within these groups when it comes to both educational attainment and wages. Construction workers and installation, maintenance and repair workers earn the same amount as community service workers and teachers, even as formal education requirements or norms could not be more different. The reason is that both types are skilled workers, however in one set, the training takes place on the job while in the other, the training takes place in the classroom. See the addendum for further educational attainment breakouts. 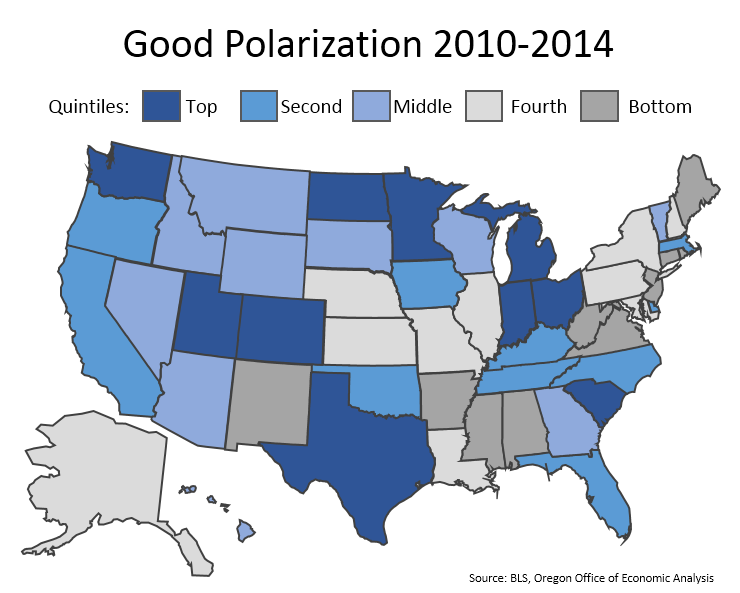 Lastly, the map below compares states in terms of “good polarization,” which I define to be high- and middle-wage job growth. This leaves to the side low-wage jobs, which most analysts and policymakers do not focus on in terms of broader economic development. The top two quintiles are above the U.S. average while the bottom three quintiles are below the U.S. average. I will have more on state-by-state job polarization in the near future. 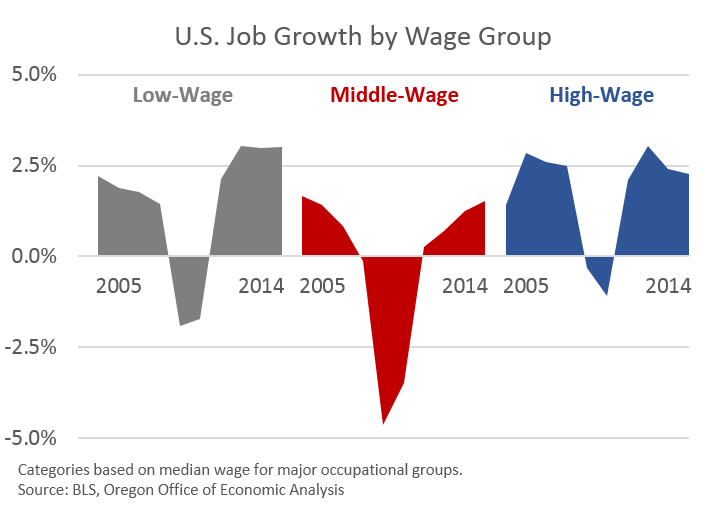 See the Federal Reserve Bank of New York and/or our office’s previous report on job polarization in Oregon for a good start on state level analysis, for those interested. « Portland Housing Update. Are things OK?